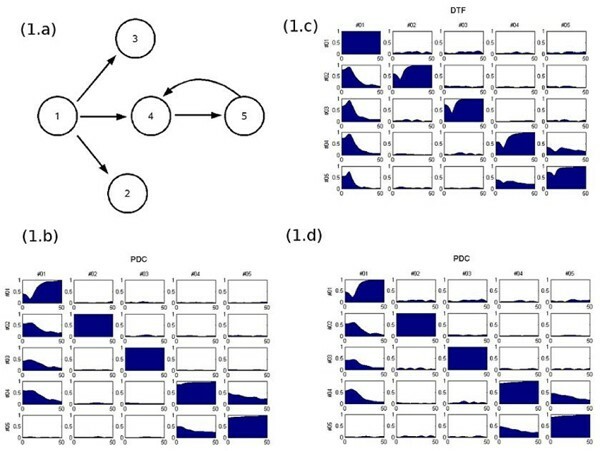 In recent years, significant efforts have been aimed towards the development of methods for identifying causality in information flow between brain areas from MEG/EEG data. As such multichannel time-series correspond to inherently multivariate processes, bivariate causality measures such as the Granger Causality Test can only be inconsistently applied. Two recent methods, the Directed Transfer Function (DTF) and the Partial Directed Coherence (PDC) , have been widely used in intra-brain connectivity studies. These methods study the frequency characteristics of multivariate autoregressive models (MVAR) built on time-series of activated brain sources. These time-series are reconstructed from MEG/EEG sensor data through spatial filters derived commonly by beamforming algorithms . The large number of potential activation sources produced by such algorithms corresponds to a large number of activation time series, too many for the derivation of robust multivariate autoregressive models. Typical methods of overcoming this obstacle make a priori assumptions about certain brain locations of potential activity or eliminate areas with low neural activity index (NAI). This is a significant drawback, as neglected areas or areas with low NAI might contain important functional connectivity paths and causality information. In the main part of this work, we investigate the derivation of the multivariate autoregressive model directly on MEG sensor data and subsequently its projection in the source space within the brain through the spatial filters. Here, the modeling process is performed on the sensor space which has moderate dimensionality as compared to the high-dimensional source space. This leads to greater model robustness as well as significantly reduced computation times. Simulated brain activation signals were used and MEG pseudo-data was produced from the model of a 4D-Neuroimaging 248 channel system. Activation signals were modeled as synaptic potentials in 10,20 and 40 Hz with added white process noise. The results of this investigation show that causality information is correctly mapped between the models in the sensor and source spaces and thus causality between all potential sources can be investigated. The figure shows the comparison of causality information between the MVAR model projected from sensor space to source space through the pseudoinverse of the Leadfield matrix and the MVAR model developed directly from five simulated signals with predetermined causality. This causality configuration is shown in figure 1a. Figures 1b and 1d show the PDC for all pairs from the original signals model and the projected model respectively. Figure 1c presents the DTF of the projected model for comparison with the PDC in figure 1d. Comparison of causality information of the projected sensor space model with original signals model. 1a. Causality configuration of 5 activation simulated signals as damped oscillators with frequency 10 Hz. 1b. Partial Directed Coherence (PDC) of the original simulated signals through an order 10 MVAR. 1c. Directed Transfer Function from sensor space MVAR model projected in source space through Leadfield pseudoinverse. 1d. Partial Directed Coherence from sensor space MVAR model projected in source space through Leadfield pseudoinverse. The investigation of causality analysis through multivariate autoregressive models, built directly in the sensor data space, showed that not only is it a feasible process but also it offers the ability to perform causality analysis between a large number of sources in a computationally efficient manner. These promising results suggest the use of the proposed method for effective derivation of high-dimensional models in the source space that can then in turn be used for exhaustive search for causal effects in functional brain connections. Further improvements are investigated for increasing the efficiency of such a search. One under validation is the reduction of the source space through the use of bivariate causality measures which, although inaccurate, can potentially provide a coarse topology of the activated areas which can then be isolated and investigated more in detail through DTF and PDC.